We are hosting a nourishing, six day retreat on the beautiful island of Ibiza! Learn how to cultivate your inner power, and activate your self-healing abilities. 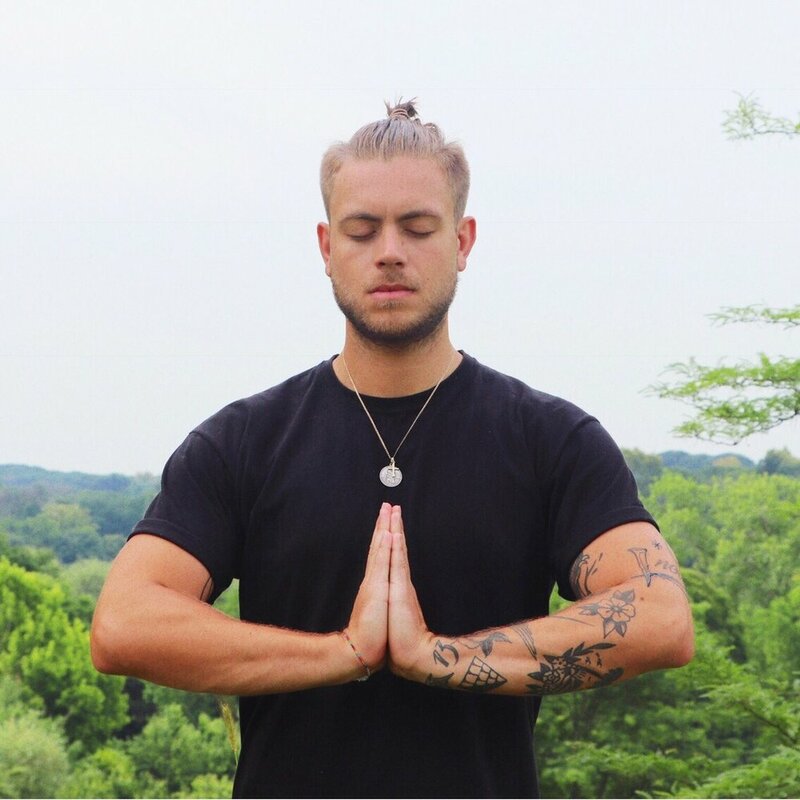 Jamie Hughes is your experienced Qi Gong Instructor, he teaches weekly classes at yoga studios, offices and hospitals in London and also leads meditation using various Pranayama techniques. Specialising in Zhineng Qigong, he holds the key to your mental and physical freedom; tackling deeply rooted health issues that we are told are irreversible. Jamie is well-practiced in various forms of energy-work, is a keen yoga practitioner and is closely connected with his higher-self and guides. Eddie Mango is a holistic personal trainer with over 10 years experience in the health and wellbeing industry. His journey with yoga started 7 years ago, and recently lead him to Ecuador where he studied the Kaula Tantra sequences and philosophy with Durga’s Tiger School of Tantra, Yoga and Shamanism, gaining his 200 hour Yoga Teacher Certification. Eddie draws on practices from around the world to help cultivate self awareness and tap in to the body’s ever changing needs, honouring mind, body and spirit both independently, and as a whole. Jessica Bacchus first started practicing yoga when she was 16. A lover of weightlifting at the time, yoga was a great way to release the physical tension caused by intense workouts! Deepening her practice and finding yoga as a way of life, she started to see the mental and emotional benefits and decided that she would love to share the path with others. She did a 200 hour Yoga Teacher Course with Durga’s Tiger School of Tantra, Yoga and Shamanism. Her intention is to be an accessible teacher with accessible tools. She believes yoga can be used in any way for any body and is passionate about helping people connect with themselves. Solara An-Ra, author of ‘Pleiadian Emissary to Gaia’, is a cosmic channel who works primarily with the Star Councils of Light, a collective of Star Beings who are assisting us through the ascension process that we are experiencing on Earth between 2011 and 2035. Through her guides and Higher Self, she teaches vital skills to both beginners and the more experienced, such as: - a felt experience of your chakras, how to ground yourself, reclaim your power, connect with your Higher Self and move into a heart-centred way of being. On this retreat Solara is offering 2 sessions in which she will channel guidance directly to the group. This is a blessing beyond measure, to receive guidance that leads you forward on your path ~ the path which leads you towards consciousness expansion, health, abundance, healing and activation of your gifts. One of the sessions will include a ‘Chamber of Light’ which is like a group healing session, giving through the Star guides. The Time Is Now! Casa Solara is a light and airy villa set in the Can Guasch-Atzaro valley in the north of the island. The centre is surrounded by farmland and gentle pine-clad hills, with beautiful beaches only a short drive away. Zhineng Qigong was created by Dr. Pang Ming, an M.D. and Doctor of Chinese medicine. In 1979 he developed the form in search for more a powerful way to help his patients heal themselves. The methods are simple, safe, but highly effective. Qigong is designed to build the physical body up, from it’s lowest ebb, to full vitality. We open our hearts in love and gratitude. We shift our focus into positive thinking. We move our bodies in a meditative state and expand our minds. Jamie is bringing energy-work and mindfulness to the foreground; where it belongs! Kaula Tantra Yoga is a deeply restorative and meditative practice with a focus on balancing our feminine and masculine energies. The Tantra Yoga asanas are derived from the Vedas, the most ancient metaphysical knowledge available to man. These asanas are designed for students to balance their intrinsic energy system (Prana) and to root themselves in Infinite Consciousness. Sincere practice leads students to release deep-seated tension and fears, and to express their true Selfhood from a place of Love and Freedom. Ultimately, students experience a shift in identity and learn to view themselves and others as divine beings. While this yoga naturally increases strength, flexibility, precision and health, this is not the primary focus. This traditional form is unique because it changes not only the physical, but impacts the psychological and spiritual realms as well. Kaula Tantra Yoga is a gentle practice open to all levels. This yoga series is practiced in a slow and flowing manner to build patience and awareness. Each asana is held gently for a period of time to allow students to relax into the posture. This way, each individual finds their own unique way of expressing the asanas without the pressure of competing or ‘performing perfectly’. Tantra Yoga facilitators approach students as whole human beings and discourage ‘isolating’ or forcing muscles. Their priority is to hold a space of acceptance and love, with only minimal guidance where necessary. Over time, students learn to meditate in the postures to connect with the Divine. Santa Eularia is a 5 minute drive/ 15 minute cycle away - handy for banks, restaurants, shops & the town beach. If you want to explore the island in your free time you can hire a car - 2, 3 or 4 people can share the cost. (This also saves on transfer fees as you can pick up the car from the airport.) Try www.skyscanner.com, www.doyouspain or www.okrentacar.es and pay before arrival - it is cheaper. Follow the first 2 yellow & black 'Atzaro agroturismo' signs - but not the 3rd & last sign - turn left instead, Casa Solara is the first house on the left with blue flags. Follow IBIZA (EIVISSA) signs until you get the option SANTA EULALIA/PORTINAX - follow the road straight to SANTA EULALIA. At the roundabout just outside the town take the 3rd turn-off to SAN CARLES. After 0.8km take the LEFT fork, towards Atzaro. (There is a 'Can Mayol' sign here with a horse picture). After 0.6km at the 3rd Atzaro sign (fluoro-orange on cement electricity pole) TURN LEFT (do not continue to Atzaro!) - it's the first tall white house on the left with blue flags.